Pokéballs at the ready – the guys and gals at Virgin Active might have just discovered the next big fitness craze. You’re hooked on Pokémon Go so what’s next? Pokérunning of course, and I was lucky enough to be invited down to Virgin Active’s Walbrook gym in London to try out the world’s first Pokérun! Caught a real Pikachu at Virgin Active Walbrook! I’m a bit of a noob when it comes to Pokémon Go – I downloaded it in a spare moment last week and quickly caught a Bulbasaur, before becoming too busy to look at it again. The app has caught on like wildfire around the globe, although not without criticism, with server problems and players getting into dangerous situations while catching them all. If played with a bit of common sense, the app is great, and the Pokérun certainly gave me a crash course in how to play it with a little more success as I’ve now reached level three! The game is simple: using your GPS, you walk around searching for Pokémon. When you find one you fling Pokéballs at it until you catch it. There are Pokéstops at places of interest where you can top up your stock of Pokéballs and ‘gyms’ where you can pit your Pokémon against others. I can see why it’s caught on – if you remember the nineties card craze this is definitely a major step up from playground swaps! After meeting at the Virgin Active Walbrook gym and getting a briefing, we set off around the city, phones in hand and water bottles at the ready (naturally we just happened to pick one of the hottest days of the year for this). The Virgin Active staff had planned the event really well – it was a lovely route for a sunny day and the pit stops for bodyweight exercises and, of course, Pokémon catching were great fun. It’s amazing how big Pokémon Go has got! People were asking us which Pokémon were about as we jogged past. 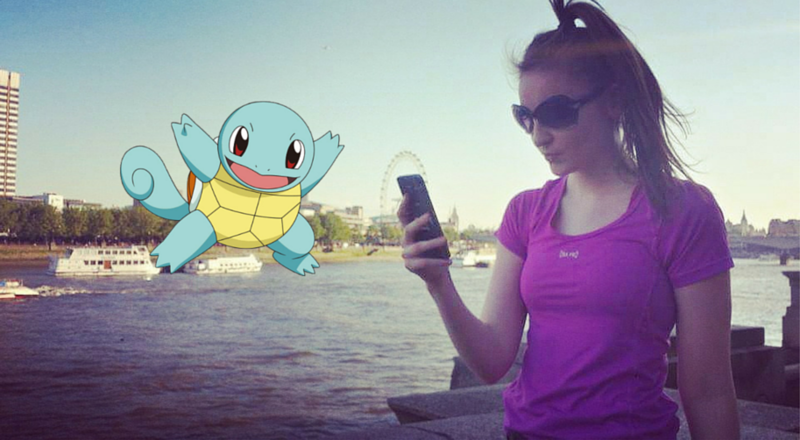 Although, the one problem with ‘Pokérunning’ in London is the obvious issue with dodging people that don’t want the Pokéchat and just want to walk. Even when we got down to the Thames where I thought it might clear we had issues picking up speed. This hobby may be better suited for less built-up streets! But I can’t deny that despite the heat and tourist-dodging, I had a fantastic time. It’s nice to have a distraction from what is essentially exercising in the scorching heat, and the Pokémon element to the workout meant the time flew by. It was also a great talking point, and I found myself chatting to loads of my fellow runners as we went. I even got a few tips on how to optimise my particularly pants Pokéball lobbing technique! I must say my legs are aching today too, so the workout itself must have been a good one. The verdict? Seems to be a winner with the first Pokérun group. Pokémon, a good workout and a sociable 5k. What’s not to like? Thanks to Virgin Active for running this event. Check out their Twitter page for more on this awesome Pokemon-themed workout and other ways to stay in shape.